Home / baseball hitting drills / How to learn Mike Trout Bat Speed and develop Bryce Harper power! How to learn Mike Trout Bat Speed and develop Bryce Harper power! Every hitter dreams of being able to swing the bat with bat speed and bat control like Mike Trout…..
Or hit 440 ft home-runs like Bryce Harper. What’s really interesting about these two players is that they have been able to demonstrate their incredible tools without a lot of major league experience. I think one of the main reasons why they have been able to do so is because their swings are pretty much mechanically sound. Their swings aren’t perfect but they’re able to pretty much execute a good swing on almost every pitch they swing at. What if I told you that you could do the same and model Bryce Harper hitting mechanics? Here are 2 SIMPLE, SHORT & SWEET hitting tips that can help you in no time! Hips are locked and loaded & Front shoulder stays closed! One of the biggest flaws you see in hitters at all levels is the tendency to do two things. What happens is that when a player is not picking up the ball in time, or if overall bat speed has slowed down, the tendencany to open up the hips or front shoulder becomes common to help compensate for the inability to get the hands through the zone in time. When this happens, you not only lose a LARGE amount of power and ability to drive the ball but you lose the ability to stay back on off-speed pitches, and most importantly the ability to hit the ball to the opposite field. Quick Fix: A great way to fix this bad habit is to keep things simple. Make a mental note of keeping the front shoulder in with the hips locked and loaded until you’re ready to EXPLODE on the pitch! It’s that simple! It’s a physical adjustment that’s made by a “mental note”! So you have GREAT bat speed from keeping your front shoulder and hips locked and loaded! What next? Where does all that bat speed go? It gets translated into your front leg! As with the previous hitting flaw having a bent fron knee during point of contact is something you see with younger hitters who have yet to develop the lower body strength to transmute the torque that’s created from the core. What this does is take away a larger amount of the POWER that you’ve created with your core. 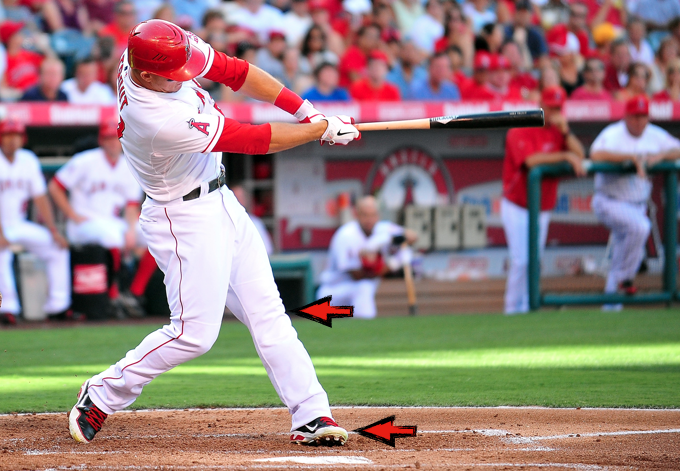 Quick fix: If this is a problem that you have noticed having, a great way to remedy this is by attempting to drive the back leg knee into the front leg knee at the point of contact. What this will do is help incorporate proper positioning of both legs at the point of contact while making sure you’re utilizing all the torque you can! Who do you enjoy watching hit more? 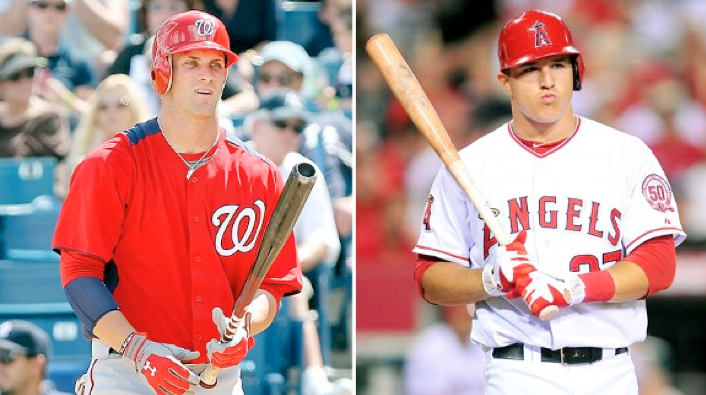 Harper or Trout?! !